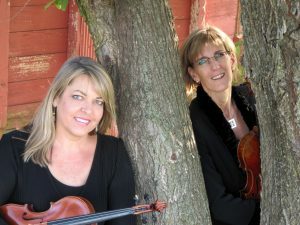 Newton Medical Center has partnered with renowned violin duo, NOVA DECO, to bring live music to patients and visitors. NOVA DECO was formed in 2009 by Nancy Johnson and Dominique Corbeil. Wichita Symphony Orchestra members and stand partners, the two violinists bring considerable experience to their performances along with the joy of playing and collaborating together. Nancy and Dominique are Artist Teachers with Arts Partners of Wichita and present programs to schools in the Wichita area. They perform an annual recital in support of the Rupert Hohmann String Scholarship at Bethel College, where they are also principal players in the Bethel Philharmonia, a student and community group. Nancy Johnson has been Principal Second Violin in the Wichita Symphony since 2000. She is also on the faculty of Bethel College in North Newton, teaches private violin students, and performs extensively in the greater Wichita area. Nancy was raised in Colorado and holds degrees in violin performance from KU and Virginia Commonwealth University with post graduate work at the University of Northern Colorado. Before moving to Kansas, Nancy lived in Portland, Oregon, where she played with the Portland Opera Orchestra, Oregon Ballet Theatre and, on occasion, the Oregon Symphony. Nancy continues to return to Oregon every summer where she is a member of the Oregon Coast Music Festival Orchestra in Coos Bay, Oregon. She lives on 5 acres north of Newton with her two sons. Born in Montreal, violinist Dominique Corbeil has performed with orchestras in the U.S., Europe and Canada. She received her musical training at the University of Montreal, studying with noted violin soloist Vladimir Landsman, and at Montclair State University with Oscar Ravina of the New York Philharmonic. Currently Ms. Corbeil serves as assistant principal second violin with the Wichita Symphony Orchestra and performs with the Wichita Grand Opera. She is also a member of the Tulsa Symphony Orchestra and Tulsa Ballet Orchestra. Since 1999 Dominique has been a member of the Colorado Music Festival. For the past 20 years she has maintained a successful private music studio. Dominique lives in Wichita, Kansas with her husband, timpanist and percussionist Jerry Scholl and son Olivier.